Hurling is expected to be included on the Unesco list of the “world’s intangible cultural heritage” in 2016, The Irish Times reports. Of course Barry is using the verb moonlighting in its common definition of a secondary job. But the word has origins in the nighttime agrarian violence of late 19th century Ireland. It was the guerrilla warfare or terror tactic of rural nationalists fighting against the English land tenure system. 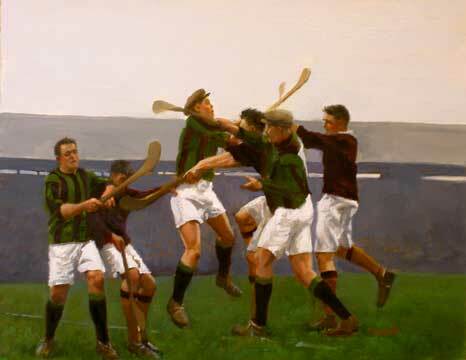 The Hurling Match. Painting by Martin Driscoll. For a while, the game enchanted the gentry, with landlords fielding teams to play other estates. But they gradually distanced themselves from the game, either having concluded that such Irish pursuits were beneath them or suspecting that hurling smacked of rebellious nationalism. The game’s hold had loosened by the mid-19th century. The Roman Catholic clergy disapproved. The police distrusted large gatherings. Some areas used matches to settle scores. And the wholesale death and emigration caused by the Great Hunger, the potato famine, darkened everyday life in places like Kinvara. But in the early 1880s, Michael Cusack … began championing Irish customs, at a time when English games, especially cricket, were growing in popularity. His crusade coincided with a renewed push by Irish nationalists for home rule. He and others soon established the Gaelic Athletic Association, which provided a nationwide structure for Irish sports based on parishes and territorial boundaries, all with an implicit rejection of English ways. The game survived, and even thrived, in the destiny-determining decades that followed, through the audacious acts of rebellion, the Irish War of Independence, the civil war. There is certainly plenty of evidence of nationalist sentiment within the ranks of the fledgling G.A.A., especially in the west of Ireland. For those interested in the subject, I recommend “Forging A Kingdom: The G.A.A. in Kerry, 1884-1934,” by Richard McElligott; and “Land, Popular Politics and Agrarian Violence in Ireland: The Case of County Kerry, 1872-1886,” by Donnacha Sean Lucey. I don’t know if Barry and the Times‘ editors are aware of the historical meaning of moonlighting. I’ve dropped him a line to ask and will post his response, if any. It’s use here certainly isn’t incorrect. And at least the story doesn’t mention anyone boycotting the hurling matches for being too rough and tumble. But that would be another blog post. This entry was posted in History, Sport and tagged agrarian outrage, Dan Barry, Galway, hurling on August 29, 2015 by admin.